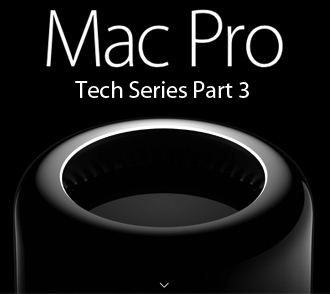 Mac Pro 2013 Tech Series Part 3: Using USB 3 devices - Sewelltech, Inc. In our previous post Tech Series Part 2, we talked about What’s Thunderbolt and Thunderbolt 2, why are they important, today in Part 3 of a 6 part series we will talk about Using USB 3 devices. Learn more about using USB 3 ports and devices on the new Mac Pro 2013. What is USB 3 (“SuperSpeed USB”)? USB 3 (also known as “SuperSpeed USB”) is the latest USB standard which offers significant performance improvements over USB 2 (“Hi-Speed USB”). What transfer rates are offered with USB 3? USB 3 can transfer data up to 5 Gbps. Does USB 3 offer more power than USB 2 (“High-Speed USB”)? Yes, USB 3 devices can use up to 900mA of power (compared to 500mA used by USB 2 devices). You’ll need to use a USB 3 cable to use the 900mA of power available. USB 2 cables don’t support 900mA. Some USB computer ports have a blue insert. Why don’t I see blue inserts on my Mac Pro 2013’s USB ports? Some manufacturers use a blue insert to designate a USB 3 port or device. All USB ports on Macs that supports USB 3 are USB 3 capable and do not have blue inserts. All devices that conform to what is commonly referred to as the “2008 version 1 USB 3.0 specification” are supported. Hubs that conform to what is commonly referred to as the “2008 version 1 USB 3.0 specification” are supported. If you plug in a USB 2 hub first, all devices connected or “daisy-chained” to that hub will operate up to the maximum transfer rate of USB 2 speed (480 Mbps). Your device should be backwards-compatible with USB 2 ports. However, you won’t get USB 3 speed and power may be limited to 500mA. Have a blue insert (usually). Have an “SS” symbol on the computer connector. Can a USB 2 cable be used to connect a USB 3 device to my Mac Pro 2013? If the device end of the cable fits into the connector on the device, yes. However, because it has fewer wires, you won’t get USB 3 speed and power may be limited to 500 mA. How many USB 3 ports does the new Mac Pro 2013 have? The USB ports use USB Type A connectors which have four pins each. USB 3 (also known as “SuperSpeed USB”) can transfer data up to 5Gbps. USB 3 devices can use up to 900mA of power (compared to USB 2 device which can use up to 500mA). Use USB 3 cables to take advantage of this functionality. Join us tomorrow for Mac Pro 2013 Tech Series Part 4: Connecting a displays and using multiple displays.